A corridor along the courtyard between the Dom and the Liebfrauen-Kirchen in Trier. Lovely light that time of day. My fourth challenge entry in a row with the 10-22. Very fun lens. Oh, yeah. Processed the daylights out of this. Well, OK, not really since daylight is still apparent, but did lots of steps. Crop - pretty significant by my standards. Adjustment layers - levels; shadows/highlights (14%/10%); brightness/contrast (6/24); flatten image, duplicate image and change blending mode to soft light. And then, yes, ladies and gentlemen, I dodged! I burned! Not a lot, but brought out the detail in the ceiling and the little wall at the back. Next, converted to B&W using the CS3 B&W adjustment; tritoned using the burgundy/gold CS3 tritone (my personal favorite). Sharpening was involved somewhere in there, then I added grain and faded to taste. I love the way this creates a diagonal. Just leads the eye right in. Deb, another one of yours that became a fav of mine. Thanks for the recipe. The image is stunning -- particularly the light on the ceiling. I also really like the little sunlight crosses on the pavement and the tritone finish. You did a great job bringing out the details and textures in the shadows, Deb. Congrats! Deb, this is beautiful! I love the sepia and the graininess. Oh Deb! This is stunning! So beautifully processed. Fine art. Even though you say you processed the daylights out of this, I think you brought out the character and mood of the space very well. It works! Wow I am very impressed. I even liked the original. Awesome processing. Thanks for sharing. If I had had time to vote in this challenge I would have given it a 10. Beautifully done! So you've found a way to enhance your lovely light & shadow plays! Goody on you! Deb - After reading the thread on this in the forums, I now feel completely cheated and lost. How could you of all people resort to that fancy schmancy dodge and burn stuff? My faith in humanity is lost. I may never again look at art the same way. I think we need to add an asterick next to this image (similar to the one that Barry Bonds needs to have next to his homerun totals). But since I can't figure out how to add an asterick, I guess I will just mark it as a favorite so I can remember the day my faith was lost. Very cool, love this! Well done on the PP! Deb, great shot. I love the patterns of light on the floor. If you did indeed process the daylights out of it, you did a fantastic job since it doesn't look too processed! very well done! Message edited by author 2008-07-21 11:54:20. Amazing clarity and detail, especially that little nice in the wall at the end of the corridor. I love the processing. Great work. Processed the daylights out of it eh? I'd say "processed the daylight INTO it", but who's quibbling? Care to share the steps? Lovely work, Deb. Great shot and fantastic processing. You've caught the light just perfectly. The 10-22 is definitely next on my list, although I'm far too poor at the moment... Well done on the great score! 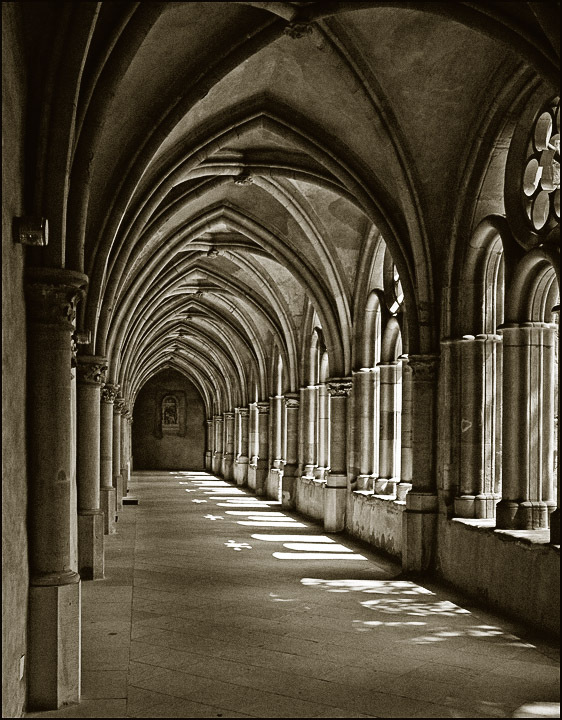 I was sure that this was a photo of the "corridor between the Dom and the Liebfrauen-Kirchen" !! Nice PP work (well worth the effort) and I particularly like the play of light on the floor - it's almost like 'anti-shadows'. Hmmm . . I might patent that term . . Anyway - glad your score climbed again. Excellent work Deb - this was my only 10 of the challenge! Very well done Deb. Perfect framing and lots of shadow detail! Gorgeous piece. Love the lines and textures. The light patterns on the walk way are very cool too. Looks great in sepia! Congrats on a great score! great lines in this shot and the tones are awesome. great shot. Very nice finish, love the coloring & showing great depth. I love the angle, the contrast, the lines, well done. It sure creates a sense for depth. Proudly hosted by Sargasso Networks. Current Server Time: 04/24/2019 03:51:56 AM EDT.